There are very few pictures of the entire earth, among them there are fewer pics in which the whole earth has been captured in a single picture.Usually pictures of earth are made by composite photos taken from different places which are put together to make a picture of earth.But this photo below is a 121 MegaPixel Photo of the entire earth shot at once from 22,369 miles away by Russian weather satellite Elektro-L No.1. In the 121 MegaPixel Photo Of Earth, the colors seem strange since we are used to NASA's photos of the earth.To capture this 121 MegaPixel Photo Of Earth, the Russian weather satellite combined visible and infrared wavelengths of light. Infrared light is used to see plants, which is why the parts of the Earth that would normally be green are seen as rusty brown, so do not freak out when you see India and see the barren brown color.It means there is a lot of plant vegetation. 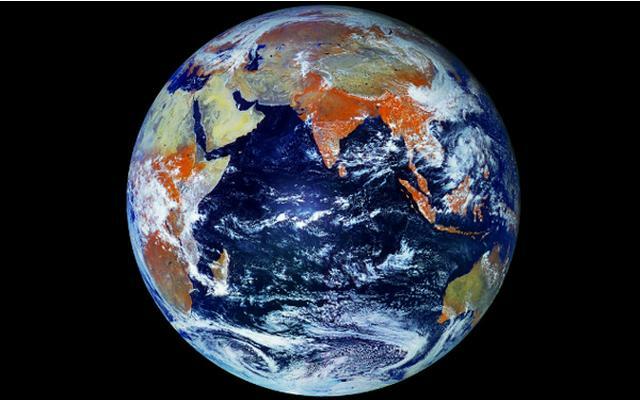 The 121 MegaPixel Photo Of Earth has also been termed as the Highest Resolution Image of the Earth yet! Here is a Time-Lapse Video of the Earth, Watch it - You will be humbled as well as inspired!